If you want a fun and effective way to talk about drugs with your teens, then the road has been paved for you. In just 12 clicks, you can have an engaging, thought-provoking discussion that is more like a trivia game challenge than a sit down discussion. 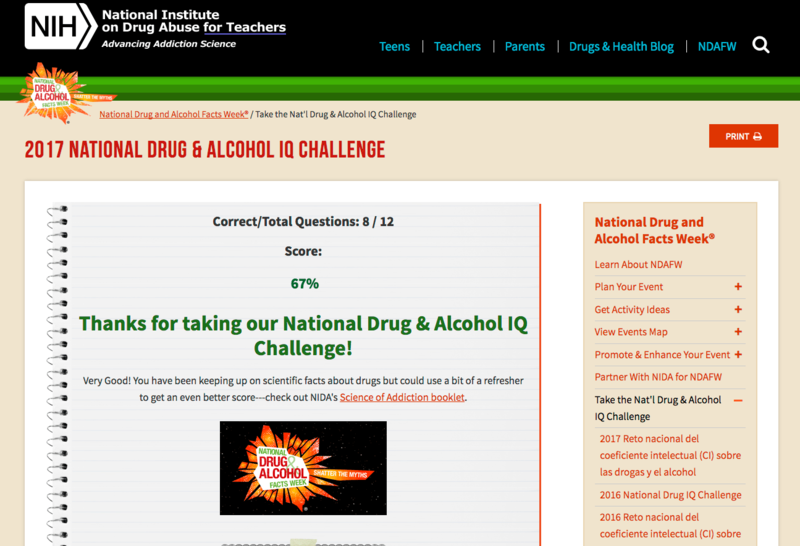 Have you heard about the “National Drug & Alcohol IQ Challenge”? No? Well, this is your silver bullet to get started. I took the 12-question quiz with my son, and we had a really good conversation that gave me a great peek into his surroundings. I got a 67 on the quiz. Now, in my own defense, there were 4 questions I missed, but I had most of the information correct on each question, so I still think I passed and did well. The National Drug & Alcohol IQ Challenge is a resource of the National Institute on Drug Abuse (NIDA), which is part of NIH (we live right down the road from NIH, so this is a local landmark). 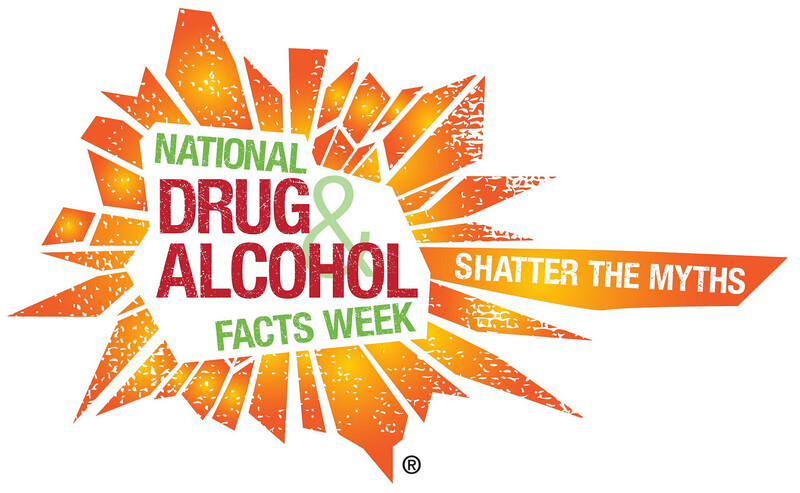 NIDA is holding its annual National Drug & Alcohol Facts WeekSM (NDAFW) from January 23-29, 2017. This event connects teens with scientists, so the dialogue and opportunity to ask real questions and get real answers far exceeds any other opportunities that address drug use. How Can This Help Me and My Teens? You may think that drugs will not impact your teens if you’re involved with their activities. But, there are two really good reasons to have a talk with your teens about drugs now. First, even if you teach them good principles, you probably haven’t had a legitimate talk with them about the dangers and current trends. Second, and equally important, teens are bombarded with false information about drug and alcohol use on TV, in the movies, on the internet and other places. So, your son or daughter may be the only person in their circle who has legitimate information. They may be the only person sitting at the lunch table who can chime in when one kid says something false, misleading and unknowingly dangerous about drug use. Not to mention, they will be that much better off by knowing the facts for themselves. Talking to your teens about drugs and drug use is almost cliché at this point. But, what have you actually talked about openly? Do you know how many kids age 12-17 actually used alcohol during the last month? Or, do you know the dangers of e-cigs and what we actually know about them? I don’t smoke, so e-cigs are a bit of a mystery to me, but rest assured, there are lots of myths about e-cigs. Did you know that many prescription pain killers can cause your heart to beat dangerously faster? How about this one: Do you know what “bath salts” are and how they are made? I’m not talking about taking a nice soak in a warm tub, I mean drugs that are made with compounds you can buy all over the place. Check out this link for more drug and alcohol facts. If you’re not sure what you should be doing, here’s the “Family Checkup” which is a suggested checklist of questions to ask yourself. It has a number of good sample videos and ideas for dealing with drug related questions and situations you may find yourself in. If your teen is using drugs and you need help, click here for videos and solid suggestions. One of the things I like about this link is that it explains why it may be hard for someone to quit using drugs. NIDA’s website has numerous materials you can use or share with others about drug addiction and abuse. I found them to be very approachable and useful for simple discussions. The bottom line is that National Drug & Alcohol Facts WeekSM can open doors and provide an easy way to regularly talk with your teen and check in with their friends as well. Try the quiz and see if you can beat my score. No cheating!